It would appear that our boy Grizzle has made somewhat of an impact with his debut music video for “All I Need is…”. And now, with great pleasure, we can present you the full video. So, almost exactly a week ago we showed you the teaser video for Grizzle’s new music video. Here is the full package, dancing tea bags and all. Directed by James Partridge, the video is quite a simple concept, but sums up both Grizzle and the track pretty damn well. It’s a surreal video (to say the least) with Grizz hosting a tea party for a group of giant dancing tea bags. 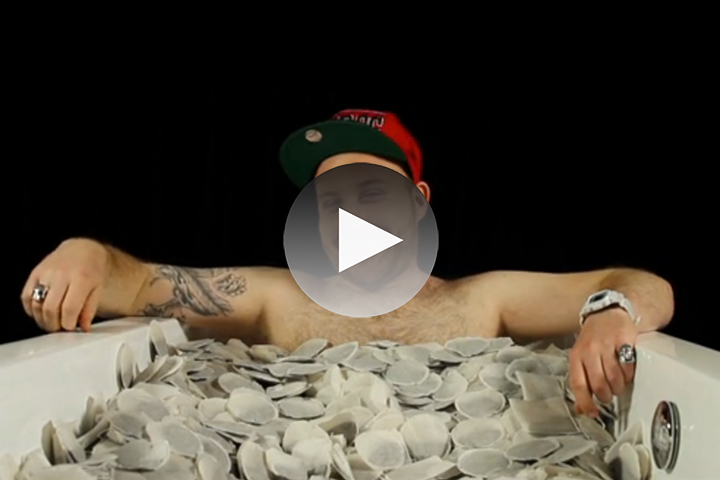 It also features Grizz lying in a bath full of tea bags – essentially, there’s a strong focus on tea. If that short description isn’t enough to fill you with so much curiosity that you have to watch the full video, then I don’t know what is. All you need to do is never try this again. then have a cup of tea. This might not be my exact cup of tea (please excuse the pun) – BUT…. At least its Grizzle doin his own thing, putting his own personality stamp on it. This is still better than most of the crap on grime daily and the like. It’s meant to be a bit whimsical, witty, tongue in cheek. If anyone can’t appreciate that then GTFOH. Glad to see its something other than the usual moody hood/estate shots, gun talk, rental cars and LV belts & sunglasses. Its supposed to be simple – it need doesn’t to be anything more – as the guy himself said, all he needs is a cuppa and a sit down.